Voodoo Vixen have made another dress that ticks all my boxes! Teal - tick! Peacocks - tick! A bit fancy - tick! Every year I like to find something special to wear on Christmas day. Something pretty and sumptuous and a bit glam. And this year I think I have found the one already! I know for some families Christmas Day is about comfort - all jeans and jumpers. But my mum is a glamazon of some note - if there is a reason to dress up she's going to. And I am definitely my mother's daughter. And so every year I am on the look out for my Christmas dress, and this year I think I have found it at Voodoo Vixen. I first saw this beauty on my lovely George from Fuller Figure Fuller Bust (she models for Voodoo Vixen and does a damn fine job of it) and I just knew I wanted it in my festive wardrobe. 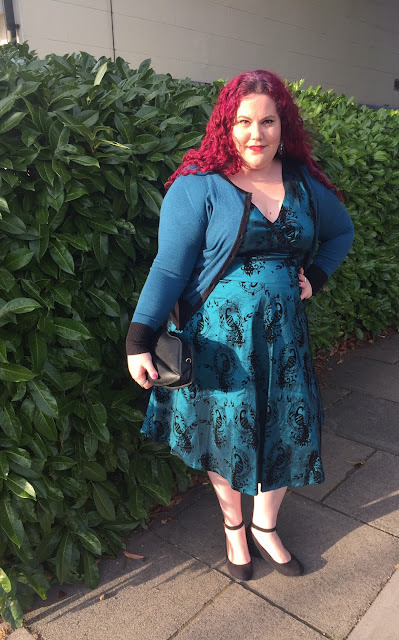 Voodoo Vixen do really wonderful day dresses, and I have quite a few in my wardrobe. 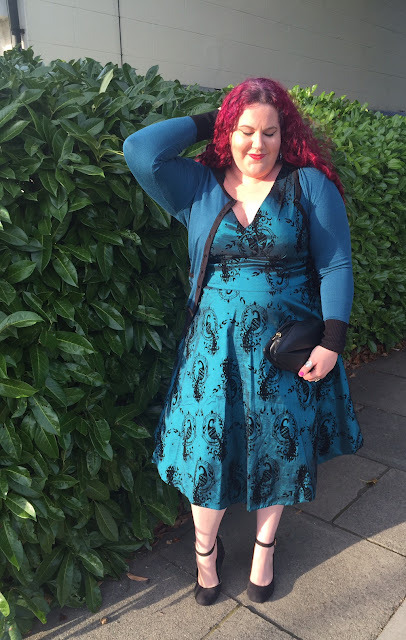 But they also do beautiful fancy pieces too - a little earlier this year I reviewed the beautiful emerald Penny Dress and now I have some more Voodoo Vixen occasion wear in my closet. Yay! 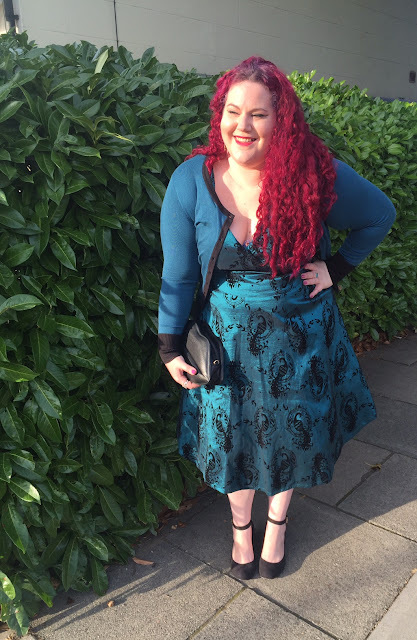 The Betty Boo dress has been designed by Voodoo Vixen exclusively for Simply Be, and features a faux wrap over bodice, which is a great neckline on the bigger busted (however I did have to add a safety pin for the sake of modesty!). Instead of a belt, there is a band to the waist which gives some definition, and the dress then flares out into an A line skirt that sits past my knees (I'm 5'8). I opted for the 3XL - according to the website this is the equivalent of a size 24, but I find the Voodoo Vixen sizes a little on the small side most of the time and as the 2XL is equal to a 20/22 sizing up was the right decision. I adore the two tone teal and black fabric, which has a metallic sheen. The richness of the teal makes this a rather unusual jewel tone, and perfect for this time of year. The fabric is embossed with a velvety design of peacocks in wreathes. This same design is embroidered on the matching Tammy cardigan, which is teal with black accents. I think the two pieces look great together, but would also maybe trade the cardi out for a plain black one. I opted for black accessories - black suede wedges and a statement black lips clutch from Boohoo. For something a bit more dressy this could definitely work with all silver or all gold accessories too. I have uhmmed and ahhed over whether to splash out on this. Now I've seen it on one blogger I think of as a 'body double' I will have to get it. You look amazing. Oh Hayley you complete and utter babe - you look stunning!